When other teams are having events with makeovers and vodka or arguing whether female fans are “Gamer Babes” or not, and OPI is pushing their MLB-approved line of colors, the Mets held a Mets Women’s Baseball Clinic Sunday afternoon that completely and totally focused 100% on baseball. There was no makeup, no knitting, no player’s wives, or any of the stereotypical activities that have been part of women’s focused MLB events in the past. There was nothing pink in the gift bag. The group of women at the baseball clinic was fairly diverse. There was a minimum age of 16 (with parental permission) but most of the participants were grown-ups. (The $100 price before service fees was probably the biggest contributor to that.) There were older women and younger women, women who had played softball in high school or college, women in shape and women who weren’t. There were Orthodox Jewish women wearing long sleeves and track pants under their skirts. There was a woman with a cane who cheered her friends on and took pictures. There were women dressed for a workout and women dressed for lunch. I didn’t walk around taking a census, but it felt like the same ethnic diversity in the overall fanbase was represented here as well. After warm up we sat on the outfield (except for those of us who wanted nothing more than to make grass angels in the outfield–that grass is awfully nice to lie down on) and Mitchell explained the rest of the day. There were five coaching stations, which were all supervised by members of the Mets’ coaching staff, and our groups would rotate from station to station: hitting, outfield, pitching, fielding, and baserunning. My group (hello, black team!) was sent off to the hitting station, which meant heading into the batting cages in the Mets clubhouse with Bob Geren. I was disappointed we weren’t hitting on the field, until I realized that they had to get the infield ready for the game (which meant ‘baserunning’ would not be running the actual bases, a goal I have resigned myself to needing to rent someone’s children in order to do the Mr. Met Dash some Sunday in order to accomplish), and until I walked into the actual batting cage. We were all kind of in awe, to tell you the truth. Bob Geren explained how he’d set up four different stations for us to hit, and explained that this was the same batting cage that the team used, and how they used it, with a funny story about how he’ll tell someone that Terry might want to pinch-hit them, so they come down to the cage to warm up and can watch the game on the tv in the corner (which before the game is used to broadcast footage of that night’s opposing pitcher), and how Terry will get nervous when he doesn’t see the player on the bench and say, “Bob, you told him, right?” only for the player to pop back into the dugout after the second out. I have not hit a ball with a bat since I was in junior high — okay, maybe early college when I “played” on my summer job’s company softball team. (I put the quotation marks there because I basically took up a roster spot, stood in the outfield and drank beer.) But I hit the ball off the tee several times, and made contact when the ball was thrown to me in soft toss, and my ‘team’ for the day was friendly and encouraging even though many of them had clearly played before and were actually good at it. Maybe other groups were different, but despite having actual talented athletes on my “team,” as well as women who needed to sit out a round here and there, no one was obnoxious about it. Probably because everyone seemed very happy to be at the event, but there were lots of cheers and high fives and smiles everywhere you looked all morning. The announcement to move on to the next coaching station arrived, and we headed over to left field and the outfield coaching station. There, Mets first base coach Tom Goodwin jokingly explained how we were the line of last defense and whatever ‘mess’ had been created by the infield, we were there to stop it. We were divided up into two groups for a ‘quarterback’ drill, where we ran out as a coach threw a fly ball at us for us. We were supposed to catch it, and then fire it back at another coach, and run back to the second line. Some of us were good at this, others were not; everyone had fun, even the woman who caught a ball on the side of her sunglasses, causing her eyebrow to bleed (and she insisted she was okay and having a great time, until someone came over to bring her to the EMT). Given that my last experience with a glove was two weekends ago in Central Park when I was getting ready for this event, I acquitted myself reasonably well, even as I found myself wishing for a stronger throwing arm. It was sunny. It was beautiful. 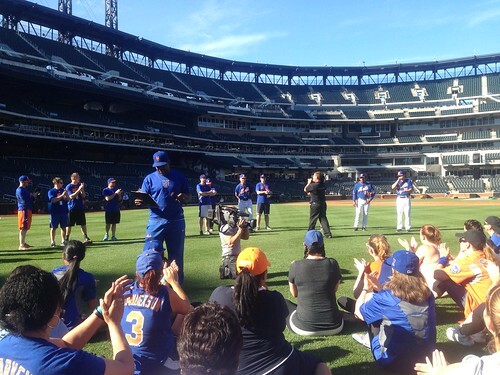 I had a baseball glove on my left hand and I was fielding baseballs in the outfield at Citi Field. Fielding was next, and Tim Teufel was waiting for us between center field and right field. He ran down the exercise, which was fielding a ground ball and then throwing it bak, and gave us some pointers, noting, “This is the same advice I give to our minor leaguers; it’s the same advice I gave to David Wright many years ago.” That wasn’t an offhand comment, but rather a pretty important point about the day’s activities: at no point were we ever talked down to, or treated like second-class citizens. This is probably the place to note that without exception, all of the coaches were all positive and friendly, down to the most junior trainer that was there. No one had the attitude of how awful it was to have to get to the ballpark earlier than normal on a Sunday, and waste their time and energy coaching women of varied athletic ability. It’s actually an enormous tribute to the organization that everyone involved in the day was as enthusiastic and energetic as they were. I know, it is hard to say so many good things about the Mets organization, but it was true, and it made me proud to be a Mets fan. That is not something we get to say or feel very often these days. I was reasonably decent at fielding ground balls, but at this point in the day, my aching shoulder was not so great at throwing them back. However, I did glow when Tim Teufel yelled, “Good shoulder!” at me, as I remembered to turn my body in the direction I needed to return the ball (while also remembering to hold my hands like I was clapping and keep my eyes in line with my glove and to point my feet in the direction the ball had to go.) It’s not that I ever thought that playing baseball was “easy,” the way a lot of fans seem to, but by the time the day was over, I definitely had a new appreciation for the training involved to build the muscle memory needed to perform this activity at a professional level. The last station was baserunning, coached by Donovan Mitchell, which, unfortunately, did not involve the actual bases. At this point in the morning it was probably a good thing that I was not running the entire 90 feet between the actual bases, although I was coaching myself internally to run through first base the same way I yell it at a player dogging it down the baseline. We practiced hitting the base, we were admonished to not jump on the base, and also practiced looking right to check in on the action and practiced different turns towards second base. I didn’t know where I had the energy to keep running down the baseline, and there were women who sat out a couple of the sprints, but I was having too much fun and it was my last station and it was going to be over very soon. Then it was over, and we gathered for the team photos, both of our group and the larger group, and then everyone scrambled to get their photos with Tim and Ricky Bones and themselves in the outfield or with the infield behind them, before heading to the auditorium for the panel discussion. I will be honest that I had fairly low expectations for the panel discussion, but once again, the Mets surprised me. The panel featured Leigh Castergine (SVP of Ticket Sales), John Ricco (Assistant GM), Josh Lewin from the radio broadcast team, and Holly Lindvall (Executive Director of HR). It wasn’t an accident that the highest ranking women in the Mets’ organization were on the panel, and they weren’t here to pander to the crowd, either. The discussion was moderated, which was better than it being a free-for-all, and the participants discussed their career path and what they do for the Mets. The questions from the audience (with one exception, noted at the end) were on point. I asked why the Mets chose this format for the event, given the other types of events held around MLB, and Leigh Castergine said, “We talked to our fanbase, and this was the event that they wanted.” Other women asked about career paths in sports, and overcoming stereotypes, and there were questions about strategy and improving the team based on its strengths and weaknesses. It was an informative and enjoyable discussion that added to the day, instead of just padding it out, which is what I had feared. The game got off to a strong start with lots of action early in the game, which was a good thing because I literally fell asleep in my seat during the 6th inning (and I was keeping score!) and headed home early, gingerly making my way down the stairs, muscles happily complaining the whole way. I never leave the game early, but it was a very long and exciting day which started very, very early, so I gave myself that out. Yes, sometimes it seems like the Mets seem to go out of their way to antagonize or infuriate or ignore their fanbase over and over and over again. But every once in a while, they manage to get it right, and the event yesterday was one of those moments. Yes, there were some small procedural glitches, but they did not overwhelm how great the day was, and what a win this was for the organization. 1) Registration took too long. I arrived at 7:30 sharp (which was when Registration opened) based on directives from the Mets to get there early to maximize my time on the field. I didn’t get inside until after 8am. Send out the waiver form in advance and ask everyone to fill it out and bring it with them. Yes, some people still won’t or will forget it, but it will take less time than asking every single person to fill it out right there. Also, instead of breaking up the registration table alphabetically, just have three stations that could register anyone. 2) Bring the drinks out onto the field somehow. You had two tables full of water and gatorade in the press room, but that would only work if everyone got time to hang out there. The back half of the line was rushed through so they didn’t miss stretching and warmup. 3) Find a more identifiable way to break the group up into teams. Too many women thought that the blue group was the group with the blue border around their name tag and not the blue writing. Every name tag had a blue border. 4) Have the photographers there early and have more of them. Since guests weren’t allowed on the field (and I am not advocating that they be allowed, because it would rapidly become unmanageable and slow everything down), the only way you could get a photograph of yourself doing these awesome things is if you had your phone in your back pocket and a friend to help out or ask someone to take the photo of you). 5) Don’t let guests into the panel discussion. I paid for this, they didn’t, and there were women standing while they took up seats. This is also so the Yankee fan boyfriend of a participant can’t hijack the discussion to ask how he could differentiate himself on a job application he sent in. Yes, it would have been great if the dude wouldn’t have been so tone deaf to think that the discussion panel at the Women’s Baseball Clinic was a great time to talk about how hard it was for him to get a job in baseball, but he did.